If you ever wondered where the stars come from, this is it. We have all been taught they are born in nebulas, and scientists have said for years that spinning gravitational forces form the matter into stars. But they have never explained exactly how. 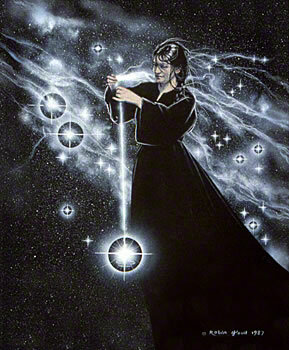 This is Stacia, the same friend who posed for Trinket, spinning star stuff. Being who I am, I made her go outside in an early New Jersey spring, stand in the winter blasted garden and spin wool while I took pictures. Then I took the photographs and made this drawing from them. Thanks again, Stacia. You were very patient with me.